Good morning! I am so excited for the Second Year of the Year Round Christmas Challenge! Last year, I tried to complete one Christmas project each month and then post about it on the 25th. Even though I resist doing red and green projects before Thanksgiving- I was hoping to complete some fun recipes, decorations and presents early. I missed a few months but the challenge did help. We had a hectic fall, so I was very glad to have some projects and decorations already done. 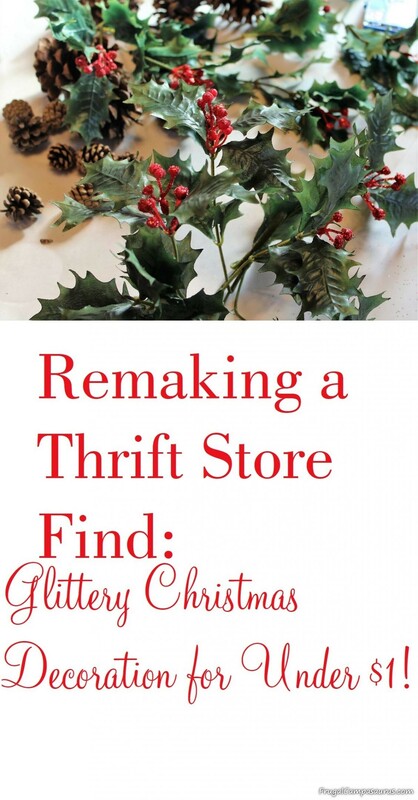 I was soooo glad, that I’m continuing the Year Round Christmas Challenge this year! 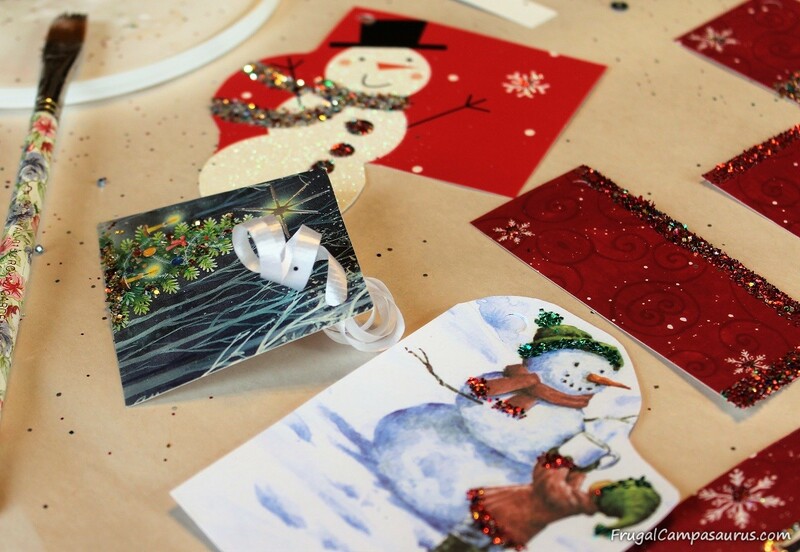 In fact, the 1st January project for this year is glitter gift tags- just like last year! Since I reuse gift tags, I still have a lot-but we also received new Christmas cards. With ribbon through a partial hole punch, I don’t need to use tape or a knot! They stay on the curly ribbon just fine. Instead of letting the pretty cards pile up (again!) or throwing them away, I cut them into gift tags. Then, it’s easy to brush or dot glue onto the tags with a small paint brush. I set the brushes in a cup of water, to keep the glue from drying on the brushes, while I sprinkled on glitter. Sometimes, I straighten up the edge of the glitter by pushing it with a card scrap. This year, there were a lot of pretty red cards for tags. It’s fun making the cardinal feathers, snowflakes and snowman scarves and buttons sparkly! With the glitter accents and borders done, the gift tags are festive and ready for next year! In fact, with a partial hole punched in the corner to string with ribbon, they are ready for many years! No need to throw away pretty tags! I am super happy to finally finish the second January project! 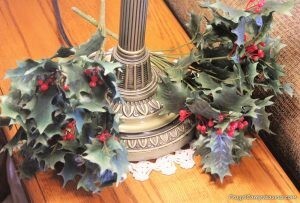 The lamp decoration, like last year’s front door wreath, has needed to be done for a few years. Every Christmas season I think about working on the lamp decoration and fixing it, but the it never gets done. 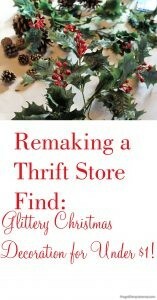 I love finding frugal craft supplies at garage sales and thrift stores! Though we collected the pine cones while camping. Thanks to the Year Round Christmas Challenge, and a thrift store makeover project- the lamp will be decorated for next Christmas! No more single, lonely bow on the lamp. 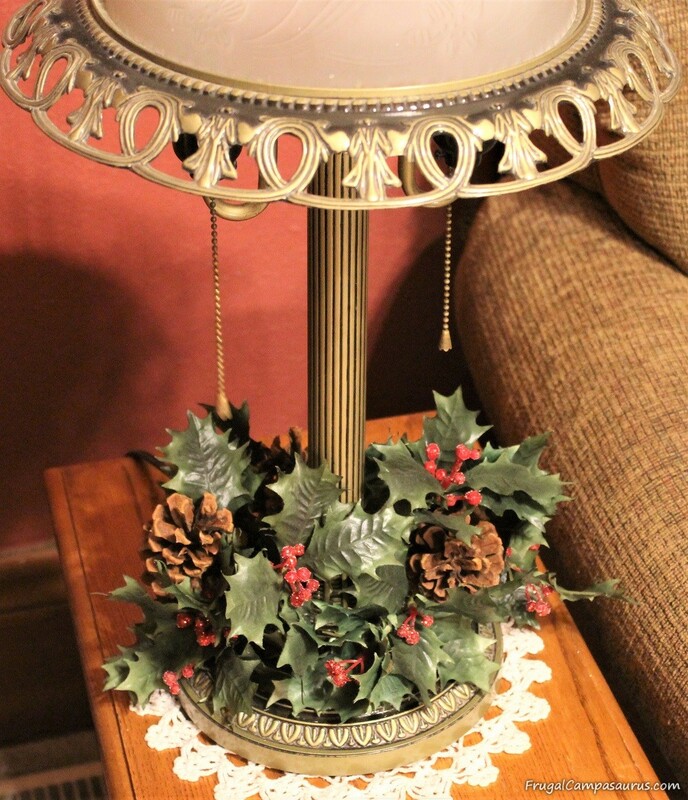 No more painted (and of course, glittered ) pine cones falling off the end table every time we turn on the lamp! I’ve been watching the thrift stores for an old candle ring or small wreath to set around the lamp base. 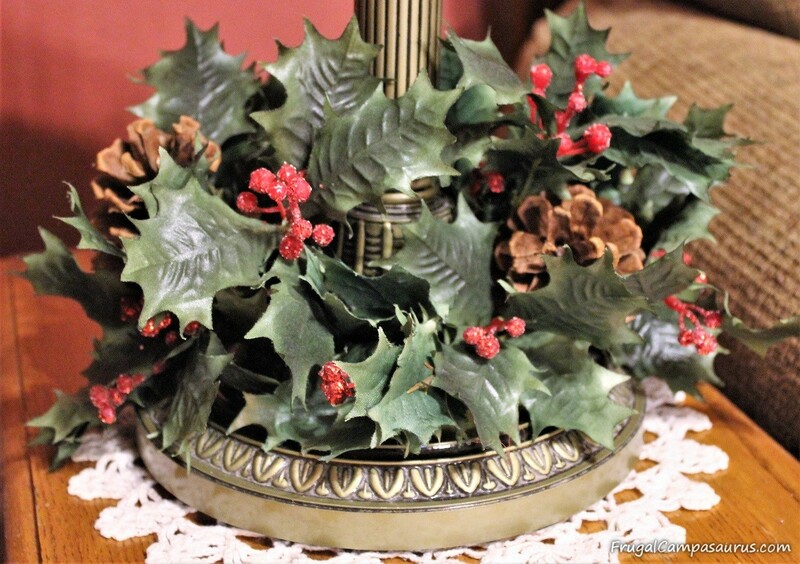 But when holiday items went on sale 75% off- I was excited to get both holly bushes for less than $1! My original idea was to bend each in half and stack them to cover the wires. It worked good in my head-just not good on the lamp. 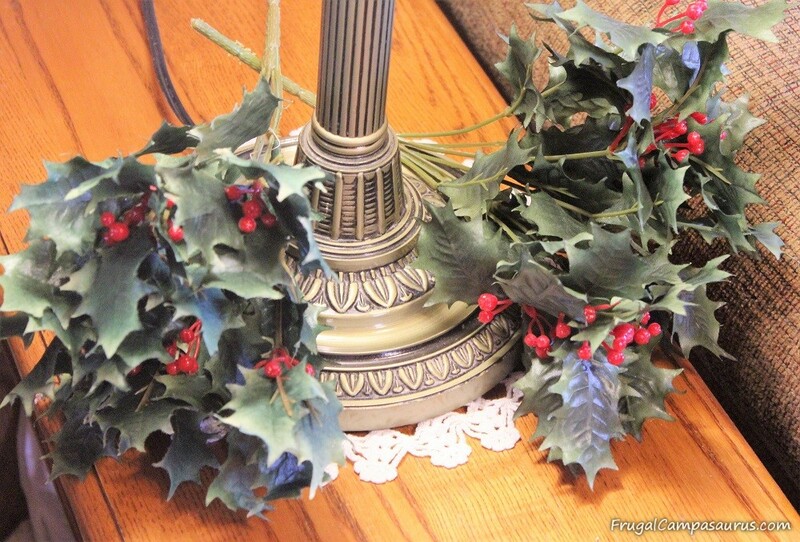 With both greenery bunches stacked up, it was just too tall for the lamp. 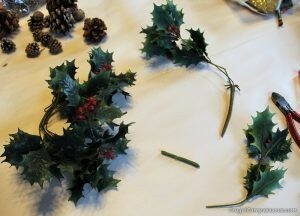 Thankfully, cutting one of the holly bushes apart was easy. Then, I twisted the branches onto the other bush to hide the bent wires. I shaped the second holly bush into a horseshoe, easy slide on but still secure and snug around the lamp base. Since I wanted it festive (and I love glitter! 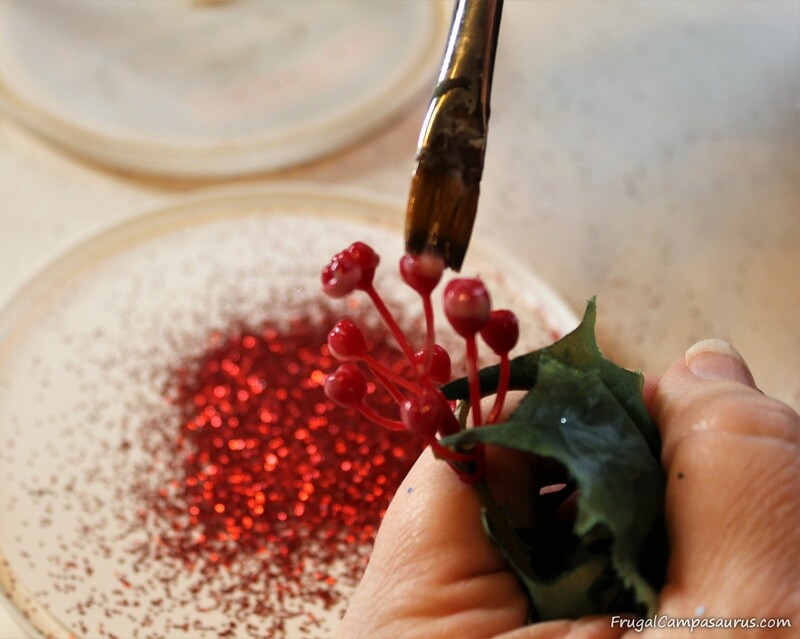 ), I brushed glue onto the berries and then sprinkled them with glitter! Thankfully, I could just hold the leaves back so they also didn’t get covered with red glitter. I was surprised at how quick it was- there seemed to be a lot of berries, but it took less than 10 minutes to finish all of them! I’m so glad I didn’t procrastinate– I was dreading doing all the berries, but it was done and dried quicker than I thought! I usually like painted and glittery pine cones for Christmas decorations, but my helper preferred the natural pine cones. 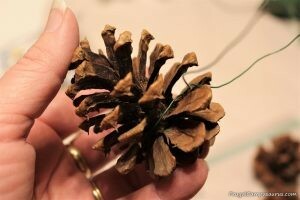 So, a few natural pine cones were wired on for accents- then the Glittery Lamp Decoration was finally done! I’m so glad to complete the January Year Round Christmas project. 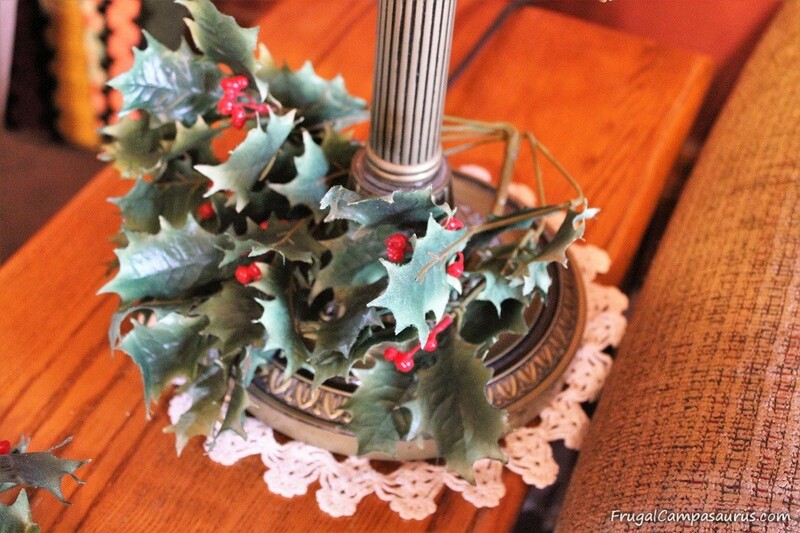 This year’s Christmas cards were used and not piled up again and, the lamp decoration was finally completed. It is great having them ready for next Christmas already. Hopefully, you will join me through the year as I complete early Christmas projects, presents and try new holiday recipes. My challenge this year is definitely going to be posting on or near the 25th of each month, but at least I am starting to enjoy red and green projects all year long! Next Post:Accidental Leftovers Make Great Pie Iron Sandwiches!